»Personality: Dyan is a somewhat quiet young man; who seems disinterested in the affairs of others; although regularly, he will help out with people with strong blood ties due to sense of duty; though this does manage to irk him. Additionally, he seems aloof and distrusting of most new people, and others who aren't in his good books. He prefers to sit back and read most of the time; enjoying not doing anything exhausting. Despite his athletic build, Dyan does not enjoy exercise in any shape of form; but when it comes to the art of battle, he loves to train, to the point that he becomes extremely annoyed when somebody implies that training and exercise are even slightly similar. Lastly, Dyan is infamously stubborn and does not like being told what to do—extremely indifferent to correction, though he has shown willingness to adapt if people he cares about ask him to do so. However, underneath all of this, Dyan is an extremely loyal and kind young man to his closest friends—turning his frown upside-down and smiling around them; being incredibly cheerful and hyperactive in their presence. He will go to any length to ensure that they are safe; becoming incredibly worried when he thinks that they are in any danger. »Likes: As stated before reading is one of his favorite past-times as is relaxing. Though he may not seem as the one to be very enthusiastic as of reading it calms him and seems to bring him into a different world. You'll find Dyan reading books in many different places during the span of time you'll be getting to know him. As well as reading, he enjoys the company of others. Though it contradicts the reading he does in the most of times, it seems to calm him when he's around other souls. He can grow to care a soul as if it was his family. It's just apart of his personality to grow to love something very much to a point. It can seem strange but this is very true in its own fashion. Even though he won't speak much, when he's around his friends he can change into another more hyperactive person. »Dislikes: Dyan is less of a 'hateful' or 'raging' soul as much as the others. He can't 'hate' something as much as other people can. But there are exceptions. The most notable are traitors. Rare among the soul society but still hated by Dyan. He has never been traitored before but he's afraid. He wants none of his beloved friends to go against him or hurt him forever. Which is why he hates traitors. People who would abandon their own kind for their personal gains. It's sickening and that angers Dyan to a point. Making him hate traitors with a passion. But traitors aren't the only thing that can prove Dyan can hate. This is a true dislike more than hate. Uneven battles can seem boring to Dyan. By uneven, I mean Dyan is facing off against a weaker opponent. It can become boring. He cannot play with battles like most souls can when facing off against weaker opponents. He'll find it boring as fights like these can butcher Dyan's love for fighting. He enjoys real battles with a true passion. Fights like these can seem annoying, even causing him to end battles like these with one blow. »Appearance Description:Dyan bears the appearance of a boy in his late teens, with raven hair, baby blue eyes and fair skin. He is tall and lean, with a slightly muscular build. While in the Gotei 13, he wore the traditional Shihakushō (死覇装; Garment of Dead Souls). But as a Wandering Shinigami (放浪死神 Hōrō Shinigami), he wears a loose, black and purple kimono and traditional Japanese wooden sandals (geta). Since his hair grew out during his Jinzen training, he uses it to cover his blind right eye. After obtaining a Gigai, he wears a T-shirt emblazoned with the words "Fear Reaper", jeans, and ordinary sneakers. After becoming a Captain, Dyan abandoned the hakama of the Shinigami Shihakūsho. His haori bears the record for the most heavily altered, as it doesn't resemble an haori at all, taking the form of a white longcoat with a zipped up collar that extends to his stomach before branching out into the standard haori design. The lining on the haori is lavender, the color of the Fifth Division. »Historical Information: Dyan was born into the Rukongai (流魂街 wandering soul city) originally under the name Nagi Arashi, though upon entering the Shinō Academy he changed it. Dyan was born blind in his right eye, an affliction no one else in his family shared. He was born in the first district, Junrinan and grew up living a solitary life with his parents and sister, usually reading or drawing, which were his favorite hobbies as a young child. As he grew older, he learned that he had high spiritual power, and even before he entered the Shinō Academy, he began learning to use his powers, typically for personal gain, like getting food and other such necessities, but he would also use them for amusement, which ranged from creating various colored lights, to attacking small animals and other children. During whatever free time he had, he enjoyed spending it with his sister. Throughout this tough time, he'd meet other children around his age and even aid people in Rukongai with his sister. This wasn't too long before he'd enter Shinō Academy. People used to recognize him and his sister in Junrinan. Him and his sister were famous around the area of they lived for them helping out the people around them. Doing errands, fixing pots, or even just having a bit of fun with the people around them. This is why Dyan has a certain love for his friends. As a child, all this love surrounding him and the fact he made friends so easily pushed him to have better friends. Sadly though after graduating Shinō Academy he had to start all over again. This didn't make him sad as it excited him with a special feeling to be able to make new friends. It was a strange call and his parents didn't enjoy it very much. They mostly kept them inside for their safety in the streets since Rukongai doesn't have the best reputation for being safe. It was also strange since most of his early childhood life was staying inside. Though after one mistake and going outside of the home changed him for the better. Strangely enough, Dyan had to grow to love fighting. As a child and being put in the soul society fighting bothered him. He thought that fighting was the worst thing. Peace was the way he thought when he was a child. That peace could be a way to unite us all together. But as Dyan went throughout Shinō Academy the birth of his love for fighting began growing. All the lessons they taught them on how to use their Asauchi's and control their spiritual power. It gave him a certain rush that can't be replaced by anything else. When sparring Dyan would go above and beyond. He strove to become stronger after learning how satisfying a fight could be when it's head to head and they both have an equal strength. He entered the Shinō Academy at a young age (by Soul Society standards) around the same time as his sister, and it was there he changed his name from Nagi to Dyan. In his classes, despite his highly marks in the practical courses, in actual studying courses, Dyan often daydreamed and was scolded by his teachers for it. In the Academy he ironically didn't have such skill in Kidō, even though he had such immense spiritual power as a child. 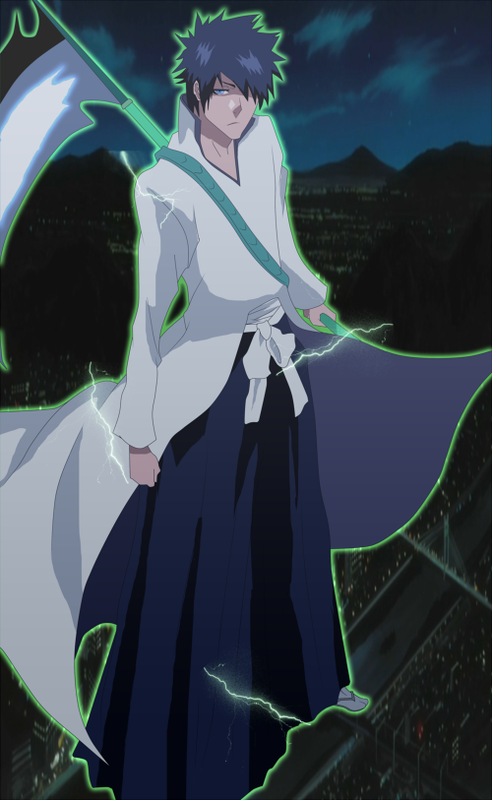 He graduated without ever learning his Zanpakuto's name and was admitted into the 5th division, where he could show his tactical advantage in a battle. During a mission in the World of the Living, Dyan was attacked by a Gillian Level Arrancar. In a futile battle against it, he was nearly killed. When the Arrancar could finish the blow with a Cero, Sōra appeared before Dyan. He asked Dyan if he had lost his will to fight, and if he really intended to die there. Dyan did not know who he was, and at first did not answer. Sōra turned to leave, saying if Dyan would not speak then it meant he could not decide. Dyan cried out he wanted to live, and Sōra told him to call out his name. He released his Zanpakutō, the blade becoming the glorious Black and Whit cleaver that it's Shikai is, and sliced the Arrancar in half with one blow. He fainted however, and awoke in the Central 46 chamber. He'd realized that he would finally get a step closer to becoming stronger after unlocking the true form of his Zanpakutō. After the speaking with Sōra he had realized what he needed to do. Grow and become stronger from a child into a man. From that point on he trained and trained until he could grow to a point where he could reach his limit. To prove his strength, as well as the strength of his Zanpakutō. »Your Sample: He stood there, shocked. All this time, this work, this training, it was worth it. This day, he'd be waiting for. It finally came. Reaching the final rank, Captain. It filled him with joy. The room was filled with a tense atmosphere though happiness was being held in for this reason. As much as he wanted to jump in joy, he had to be mature. Ignoring all the Captain-Commander's words with all these thoughts rushing through his head. This time, he'd spent. For Zangetsu and for himself, he was proud. Finally, he snapped out of his trans. Looking forward, he saw the majestic thing he'd been waiting for. The normal Captain's white haori. The black rhombus' at the end of it glowing as if they were golden in his eyes. It was special and he didn't know why. Putting on the haori, it was strange. He felt much more stronger. He shrugged it off as a moral boost. This moment was special and would stick with him, he knew it. He began thinking while this momentous moment for him happened 'Finally, after all this time. I've reached the most powerful rank, more powerful than anyone! I knew I could do this... No matter what, I won't bring shame to the name,' He spoke about all the things he should be saying in the real world 'but this is no time to celebrate. I need to show, to show them I can get even stronger. More stronger than they could ever imagine. For Zangetsu, for me, and for my friends. '[/color] He looked around at the other captains, closing his eyes calmly. He couldn't lie to himself, he was nervous. How would he prove himself to all these people? How could he command his squad correctly? But, he knew. There was no need to worry, he could prove himself. Once opening his eyes, a smirk grew on his face. After the meeting, he went off, the white haori gliding majestically in the wind behind him as he engaged in one of the most momentous moments of his life. There are a couple of things i would like to address about your app before it can be approved. 1) In your appearance you mention your outfit being of the eleventh squad though you are applying for the fifth. I do not know if this was a typo or you had used a premade appearance but this needs to be fixed. 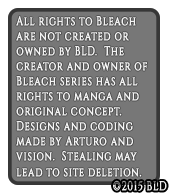 In addition to this you have mentions of zangetsu in your appearance which should also be removed as well. After these things are finished please bump your app and i shall take another look. Was this app moved for edits as it's not locked nor moved to approved section? If this app is completely done, bump this thread and I'll move it asap.